Raisins are especially good for those who suffer from constipation, fever, anemia, and acidosis. It also help in weight gain, eye care, dental care, and bone health. Regular consumption of raisins provides protection against heart disease. By lowering cholesterol as well as triglyceride levels, raisins improve the overall condition of your heart, thus lowering the risk of strokes, hypertension and heart attack. Studies have shown that eating raisins for reducing levels of cholesterol is helpful. This is due to the fact that raisins contain soluble fiber. This soluble fiber helps to lower low density lipoprotein. It also contain polyphenols which help to lower the cholesterol levels in the body. 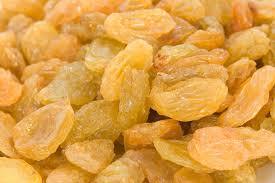 Being loaded with carbs, particularly natural sugars like fructose and glucose, raisins are a good source of energy. They facilitate efficient absorption of vitamins, proteins and other nutrients in the body. They are often consumed by body builders and athletes to provide a quick boost of energy. Upon ingestion, fibers in raisins swell as they absorb water, thus promoting a laxative effect and thereby relieving constipation. Regular intake of raisins helps in maintaining regular bowel movement, with the fibers sweeping away the toxins and waste materials from the gastrointestinal tract. Raisins contain a large amount of alkaline which helps to neutralize acids that are present in the body. It is best for arthritis treatment are recommended as it is an effective cure for acidosis. It also contain magnesium and potassium which help to reduce acidity. Raisins have high levels of catechins, polyphenolic antioxidants in the blood. These substances help to clean up the free radicals floating and destruction of cells, organ systems in the body, so they can help to prevent cancer formation, slow the development of cancer. This entry was posted in Alternative Medicine, Home Remedies Series, Human Behavior, Introducing, Lifestyle Health, Longevity, Medical Studies, Tele-Medicine, Weight Management and tagged 10 reasons, acidity reduction, Aids Digestion, anemia, arthritis, cancer prevention, cholesterol, diabetes, E Patient Helth Care, energy booster, eye health, heart health, National Telemedicine Foundation, NTF, Raisins In Your Diet, telemedicine, You Should Include by Admin. Bookmark the permalink.